One person has been injured and one structure destroyed in the fast moving Parkfield Fire. The blaze, burning between San Miguel and Parkfield, has scorched 1,500 acres and is 30 percent contained, according to Cal Fire. 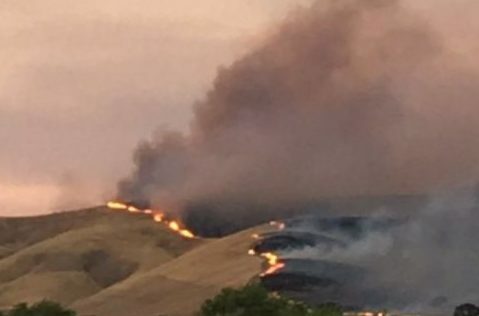 At about 8 p.m., the fire broke out near the Monterey and San Luis Obispo county line. On Saturday evening, medical personnel air evacuated a firefighter who had suffered second degree burns to his hands and face. Further information on the name of the firefighter or his injuries is not currently available. Also on Saturday evening, one structure was destroyed by the fire. Cal Fire has given evacuation warnings to residents on Vineyard Canyon, Mahoney Canyon and Lowes Canyon roads east of San Miguel.